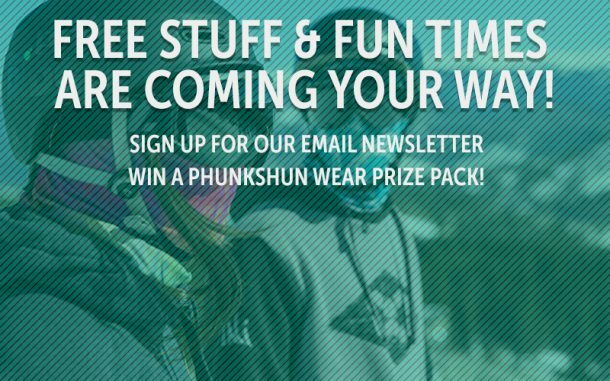 There are many facemask companies out there, but there is only one Phunkshun Wear. Do you want, no, NEED some Phunkshun Wear Stickers? Send us a S.A.S.E.! The more postage you stick on the envelope, the more stickers we will set you up with! 6900 E 47th Avenue Dr.
Our focus since day one has been to fuse together aspects of technical performance apparel and stylish fashion art. Combining these two elements allows us to deliver a Functional (Phunkshun-al?) accessory piece that out-performs the competition, and looks better doing it. Where are Phunkshun Wear products made? All Phunkshun Wear products are manufactured in Denver, Colorado. We cut/sew/decorate the raw textile fabric in-house ourselves. All items start off as a blank roll of fabric, and we perform every stage of the process, including the final packaging and shipping. Made in the USA and proud of it! Why is In-House production better than outsourcing? The benefit to owning a production facility is that it allows us to closely monitor the manufacturing process and ensure an extremely high-level of quality control. What are the products made out of? Fabrics we use range from 100% Polyester, a Polyester/Spandex Blend, and a Merino Blend. Where are Phunkshun Wear’s material suppliers located? Overall we make an effort to source material as close to our facility as possible, reducing the distance it has to travel to us and creating a more sustainable supply chain. Our Polyester fabric blends are milled in North Carolina, the Polartec® Fleece is milled in Conneticut, and our product packaging is made down the street from our space in Denver. Merino Wool is the only fabric that is sourced out of the country, which originates from Australia. What is done with waste from the product process? All scrap fabric from the cutting stage is recycled through a re-polymerization process that turns it back into fabric, on average we recycle 65 pounds of fabric scrap a week! Kraft paper, sublimation paper, etc… is reused wherever possible, as packaging/stuffing in shipping boxes, or straight up recycled. Roughly 400 pounds of paper/cardboard/etc… is recycled weekly here, and we have a 70+ % diversion rate. What is a performance fabric? Fabrics made for a variety of end-use applications, which provide functional qualities, such as moisture management, UV protection, odor control, thermo-regulation, and wind/water resistance. Why do you make different products? While the average temperature of the human body is 98.6°F, everyone feels temperature differently. We offer Single Layer masks for warm days when you want maximum heat release and moisture wicking, but maintain a UPF 50+ layer over your skin. The Double Layer mask is water repellant and mesh lined, and is our ‘everyday’ mask, useable across the spectrum of winter weather conditions. Our Thermal version of the Double Layer is Polartec® Fleece lined and really keeps the wearer warm, even on very cold days. Merino Wool is naturally sustainable, and is loaded with naturally occurring beneficial attributes including Odor Resistance, Stain Resistance, Anti-Wrinkle, UV Barrier, Biodegradable, breathable, and temperature regulating. Wearing merino wool will aid you in staying warm during cold weather, and cooling you while its hot outside. UPF, or Ultraviolet Protection Factor is a rating system to gauge how much protection from the sun a garment provides. The majority of our products are UPF 50+, blocking more than 99% of harmful UV rays. The two exceptions are the Bandanas (UPF 30+ / Very Good) and Merino (UPF 40+ / Excellent protection). Will the graphic on Phunkshun Wear products wear off like a screen print? Absolutely Not! We decorate our products through a process called Dye-Sublimation which uses a combination of water-based ink, heat, and pressure. Unlike a screen print, the graphic will not crack, wash-out, or have any noticeable fading for many many days on the hill. How do I wash my Phunkshun Wear product? We recommend hand washing with room temperature water, hang drying, and some light ironing if needed to remove wrinkles. We advise against bleaching or machine washing. How long does the Water Repellency last on the Double Layer and Double Layer-Thermal masks? This depends on the degree of usage one of these products has seen. The DWR (Durable Water Repellency) we use is rated to 25 washes, however that is hard to compare against skiing in a snowstorm for a hour/hours. Similar to many outerwear companies, our recommendation is to test the water repellency of your mask at the beginning of every season by seeing if the mask absorbs or repels a small amount of water. If the water is absorbed, it is easy to apply a new coat of repellant the fabric using a NikWax ® waterproof spray.